A superb performance saw Blyth Spartans earn a priceless 2-0 away win over Mickleover Sports on Wednesday evening. And the three points were won despite the visitors being reduced to ten men before half-time and while the game was still goalless. Blyth lined up at Station Road full of attacking intent, with Dan Maguire restored to the starting line-up, Wilson Kneeshaw playing slightly deeper and Michael Richardson and Robbie Dale out wide. Spartans were soon on the attack with the forward line looking like they were going to give the Mickleover defence a long, hard night. A wicked Dale free kick on five minutes was well saved by Ross Atkins and Maguire saw his effort from the resulting rebound cleared off the line. Blyth kept up the pressure and another slick passing more from centre midfield put Richardson through, and he cut in from the right wing and flashed a dangerous shot across goal. As if Blyth’s front four did not pose enough attacking threat, and Alex Nicholson and Jordan Watson advanced forward at every opportunity. And the visitors went close when a strong run and shot from Watson hit the bottom of the post with Mickleover scrambling the ball away before a Blyth player could capitalise. Blyth continued to pile on the pressure and a Dale free kick was smartly turned over for a corner by Atkins on 16 minutes. From the resulting set-piece Matty Wade was unable to find a free Blyth player and again Mickleover’s goal continued to enjoy a charmed existence. Blyth attacked in waves, with a tame Dale shot saved and another Maguire effort turned over for a another corner. Such was Blyth’s dominance it was not until the 32nd minute before Mickleover won their first corner. But what turned out to be the turning point of the game came on 36 minutes when Nathan Buddle was shown a straight red card by referee Mark Griffiths for a challenge on McGrath. The home player was 35 yards out and heading away from goal with Nicholson covering when Buddle appeared to win the ball. But the referee saw it differently as he went straight to his back pocket. 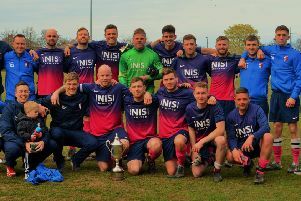 But the resulting free kick was wasted and Michael Richardson broke clear to stun the home side and score a superb goal, shooting low past Atkins. Dale dropped back into central defence but Blyth never stopped attacking, and on the stroke of half-time Kneeshaw put Richardson through again but a tame shot was easy for Atkins. Blyth went in at the interval 1-0 up and down to ten men, but wondering how they were not winning at least 3-0. A change for the start of the second half saw Danny Parker take over in the centre of defence with Maguire giving way. Blyth were not the attacking force they were in the first half and Mickleover started to pile on the pressure. Aaron Wearmouth came on for Kneeshaw on 57 minutes after the latter had pulled up with a groin strain. On 60 minutes another Dale free kick was scrambled away by the Mickleover defence to force a series of corners, none of which Blyth could convert. Adam McHugh was called into action soon after and pulled off a good save to keep out Mickleover’s first real effort on goal. Richardson tried hard to relieve the pressure and from a Blyth free kick 25 yards out struck the wall and forced yet another corner. Mickleover continued to press for an equaliser and McHugh was starting to have a busier night than he had in the first half. With 15 minutes left, Sean Reid came on for Paul Robinson as Blyth looked to close the game out for the three points. Another swerving, long range effort from Richardson caused Atkins some problems due to the swirling wind and his shot was well saved on the edge of the six-yard box but at the cost of a corner. From the resulting set-piece Wearmouth again went close. But on 80 minutes, Wearmouth’s frustration at being repeatedly fouled led to him being cautioned for a silly challenge. Mickleover threw on Hales as they pushed for an equaliser, and they went close when they hit the post from a corner on 90 minutes. But not content with trying to hold on for a 1-0 win, Blyth attacked again from a goal kick, and Wearmouth’s superb run to beat three defenders resulted in him slotting coolly home under Atkins to make it 2-0 in front of another good, raucous away following. Another superb win on the road left Tom Wade proud of an excellent team performance and keeps the pressure firmly on the chasing pack. Blyth Spartans: A McHugh, A Nicholson, J Watson, N Buddle, R Hutchinson, P Robinson (S Reid 75), M Richardson, W Kneeshaw (A Wearmouth 57), D Maguire (D Parker 45), M Wade, R Dale. Subs not used: A Cartwright, N Hooks.